I don't understand the final column. Shouldn't Scotland be "1"? Why is Denmark "2.9"? Hi anonymous - I initially posted a messed up version of the table - corrected within 20 minutes of putting it up but you were there before me! Thank you. Pity all who comment in public about such things are not so conscientious. 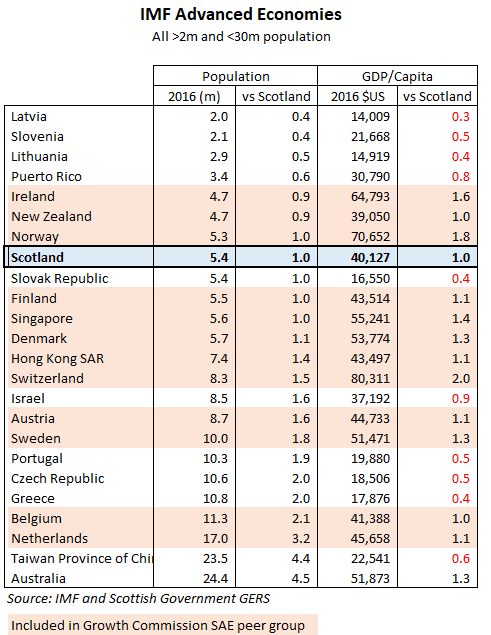 What is the source for the Scottish GDP figure? I am enjoying the forensic deconstruction of the SGC report by both yourself and Fraser. The Scottish Growth Commission are keen to broadcast there being no growth forecast or assumptions in their report. If that were true (you've proved it's not) how are we meant to measure the efficacy of the recommendations they make? It is ludicrous. "We are the Growth Commission and we've taken two years to claim we have nothing specific to say about future growth" No benchmarks, no targets. We shall make no growth forecast for fear of being branded as over optimistic. Instead, we shall spin how our simple deficit reduction plan would have panned out over the last 10 years on the basis we exaggerate actual growth by almost 100%. (0.8% to 1.5%) We are quite prepared to grossly misrepresent recent historic growth don't ask us to try and measure or plan for the future. They had 24 SAE countries to cherry pick from and aside from Australia (who would have bought Scotland being like them?) they chose the group that outperform Scotland and it call it "evidence" small countries perform better. If they were scientists they'd be struck off. In actual fact one of them in the Scottish Finance Minister. This so called blueprint for Independence is even less credible than the White Paper. "Scotland's Future" plugged the deficit with Oil and Gas revenues, which did actually exist at one time. The SGC have substituted thin air for Oil along with a simple arithmetic formula. No currency solution, no attempt to gauge the economic drag of leaving the UK. Nicola claims the offer is "hope" over "despair". It is actually jump off a cliff with no parachute and hope things will be alright. BTW we are not telling you the height of the cliff!! It's also curious that no attempt was made to include political / economic entities for which data is easily available, but which happen to be devolved units of larger countries. For example, American or Australian states, Canadian provinces. or German Laender.